Situated on one of the island's finest stretch of beach, Pantai Tengah. A picturesque beach resort boasting of a large swimming pool with open air jacuzzi, an indoor pool for ladies and a relaxation SPA. It is designed to cater to leisure, incentive and conference markets. Features 258 luxurious sea-facing guest rooms and suites with private balconies. All rooms feature modern guest amenities expected of a first class international hotel. The Beach Garden Resort is a unique setting that provides secluded privacy in Langkawi. 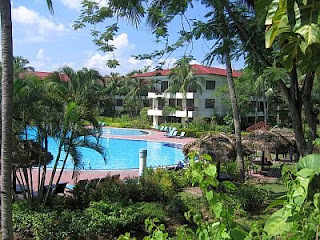 The resort is framed by gentle plants and trees with a peaceful spot of beach. The resort was conceived and built by German owners, who wanted to build a resort with amenities and comforts of bigger hotels, but with a special and intimate atmosphere. The Beach Garden Resort is located at one of the islands most beautiful beaches; Pantai Cenang which is well known for it's romantic sunsets, and just 30 minutes away from Kuah Town and 15 minutes away from the airport. The hotel is beautifully laid out around a palm-shaded pool and situated right on the beach. The Beach Garden Resort has a dozen spacious and comfortably-furnished rooms, laid out toward the sea in a horseshoe shape around the pool and restaurant. Each room had a mini-fridge, air-conditioning, ceiling fan, private safe and attached bathroom with hot and cold shower. Marble floors adding a luxurious touch of coolness to your room.